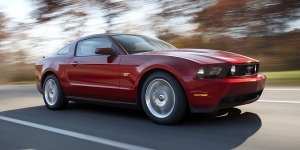 The Ford Mustang is thoroughly updated for 2010, receiving a more aggressively styled exterior and improved interior. A modified V8 engine with 315hp now powers GT models. In addition, all models receive standard ABS and stability control. Shelby GT500 models receive the 540hp engine of the previous GT500 KR.